A long lost convict: Australia’s ‘C-word’? The capture of Australia’s most wanted man last week made international headlines. Australian readers of an article in the Canadian publication Oye! Times* may have been startled to see the prisoner described as a ‘long lost convict’. 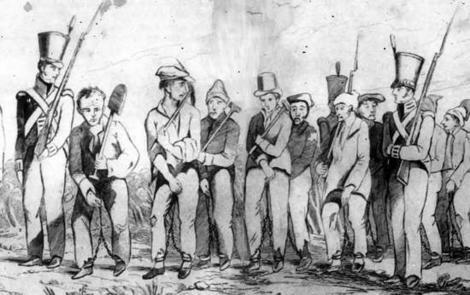 A reference in the Australian media to a ‘long lost convict’ might lead us to expect something on the discovery of information or artefacts relating to someone’s convict ancestor, or perhaps an item on William Buckley, the convict who escaped from custody in Port Phillip in 1803 and reappeared thirty-two years later. But we would not expect a story about a twenty-first century prisoner. For Australians the word convict only ever means a prisoner transported to Australia’s penal colonies between 1788 and 1868. Convict has generated many compound words in Australian English, such as convict colony, convict labour, convict gang, convict servant, convict constabulary, and convict settler, to name a few. Today these are largely historical words: when we use them they refer to something in the past that no longer exists. So it can be a surprise for many of us to find that elsewhere in the English-speaking world a convict is a common term for a criminal convicted of an offence and serving time for it. Perhaps the uneasy history of convictism in Australia meant that, following the end of transportation, our forbears just wanted to forget about it. Certainly during the convict era the word itself was often replaced by euphemisms. Bond labour, bondsman, bond population, assigned servant, government man, crown prisoner, servant of the crown, government servant – all avoid the ‘c’ word. Not until well into the twentieth century did it become common for people to acknowledge convict ancestry with pride, and by that time prisoner was long established in Australia as the common word to describe incarcerated criminals. *With thanks to Amy McNeilage/SMH for alerting me to this article. This entry was posted in ANDC and tagged assigned servant, bond labour, bond population, bondsman, convict, convict colony, convict constabulary, convict gang, convict labour, convict servant, convict settler, convict stain, convict taint, convictism, crown prisoner, free settler, freed convict, government man, government servant, penal colony, servant of the crown, William Buckley by Julia Robinson. Bookmark the permalink. Canada has been called the daughter of Britain that stayed home taking care of Mum when all the others went off to get jobs. To be sure, Canadians can’t exactly shrug off the Yank influence, but there are a number of areas where they defy it, and this may be one. I assume, though, that Australians still get convicted when they have committed crimes? In other words, presumably the ban did not affect the closely related words. Thanks for pulling me up on this John! Yes, the verb ‘to convict’ is still alive and well in Australia, as is the related noun ‘conviction’. It is only the noun ‘convict’ that I’m discussing above. Lovely comment about Canada’s relationship with Britain.